Our friends paraded with this school - Beija-Flor. This weekend was full of fun. Friday we went out with friends for sushi and had a blast. On Saturday I went to lunch with my friends and we had the most amazing salmon cesar salad and then we got frozen yogurt for dessert. We walked around and tried on makeup and perfume. I discovered that I'm in love with Chanel 5 Eau Premiere. I painted my nails a beautiful purple color and then took it easy at night with a bit of wine and a lot of Idol and SNL. Sunday I had my friends over for a simple lunch. A couple of interesting things turned a regular dish into something fantastic. I made a fresh cesar salad as a starter and served it with crispy parmesan chips* I made myself! The I made tagliarini pasta with a tomato sauce (canned tomatoes, sundried tomatoes, onions, garlic, basil, black olives and capers), served with fresh grated parmesan cheese. It was amazing! Dessert was pears pached in simple syrup with rose water and served with rum raisin ice-cream. Heaven! The delicate scent of the rose water added a touch of class and an element of sophistication that elevetated the whole dish to spectacular. After lunch we sat around and watched the 1933 classic "Lady for a Day" - so fun! Later in the evening we went out with some friends who are visiting during Carnaval and we had the best meat in the universe. I had forgotten just how good this restaurant was - Churrascaria Oasis - and I had forgotten how amazing picanha nobre is (a cut of meat only found in some high end churrascarias - Brazilian steak houses). Our friends had never been to a Brazilian steak house, and as expected were blown away. Picanha nobre really is the best, most amazing cut of meat, and the way they prepare it there is unequaled anywhere in our galaxy. A memorable experience and a great time with friends! 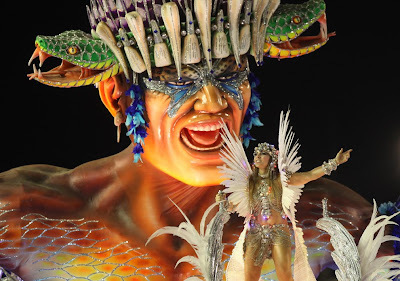 After dinner they went to pick up their costumes and join the parade with the Samba School Beija-Flor. Can't wait to post their pictures! Well, that's that. It was a great weekend full of good friends, good eats, and temperate weather. Who could ask for anything more?